Asus in partnership with Paytm Mall has launched the Vivobook 15 X507 laptop in India. It comes with 15.6-inches LED-backlit display powered by 6th Gen Intel Core i3 Processor. It weighs just 1.68kgs making it one of the most light-weight laptops. ASUS X507 has a 15.6-inch up to Full HD slim-bezel NanoEdge display and is powered by up to 6th Generation Intel Core i3 processor with NVIDIA GeForce MX110 2GB GDDR5 VRAM GPU for the high-end variant. While the low-end variant is powered by the Intel Pentium Silver N5000 or Intel Celeron N4000 Processor with Integrated Intel CPU. It runs on the Windows 10 Home and weighs just 1.68kg. It comes with 1TB SATA HDD storage with a large 1TB HDD, dual-band 802.11ac Wi-Fi. It also comes with a fingerprint sensor for quick and easy logins with Windows Hello and comes with VGA web camera. It also has support for ASUS SonicMaster Technology. Unlike the variant that is available outside of India, the variant that launched internationally is aimed at the entry-level segment. The X507 also supports fast charging and can charge up to 60% in under 50 minutes. Paytm Mall which is owned by Paytm Ecommerce Pvt. Ltd has announced the launch of its connected PoS solution for retail stores, empowering shopkeepers to manage their offline and online customers. It has partnered with Asus India in implementing this PoS solution at ASUS retail stores. The Paytm Mall PoS solution helps in maintaining a real-time inventory database as well as tracking sales which is a major challenge. 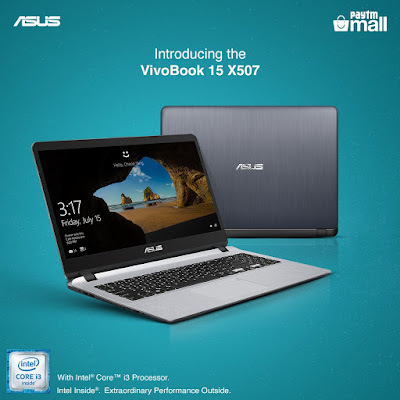 Asus Vivobook 15 X507 laptop comes in three variants, is available from Paytm Mall starting at Rs. 21,990, and also includes Rs. 2000 Paytm Mall cashback.